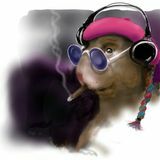 The Marvin Hamster Music Emporium is a weekly radio show of alternate music from the 80&apos;s and 90&apos;s. Marvin Hamster, your rodent of retro, selects two hours of College Rock, Alt Rock, Early Techno and Industrial, or what ever strikes his fancy, for your listening pleasure. Adjust your raspberry beret, move your tri-color rat tail aside, put on your headphones, light up a clove (if you got &apos;em), and tune in! Glare with disdain at anyone that doesn&apos;t get it. The Marvin Hamster Music Emporium got started as the "New" Music Emporium around 1982 in Ames, Iowa, at the student run College radio station, KUSR (formerly KPGY). Back then the music was new, and the hamster voice was higher. Now the show plays every week on KTHO AM/FM in South Lake Tahoe, CA, (kthoradio.com), and 107.5 AndHowFM in New Zealand (andhow.org).